Reflexology, not to be confused with massage, has been practiced as early as 2330 B.C. by the Egyptians. Eunice Ingham, a pioneer in this field wrote a book published in 1938 about the modality. In a typical session the therapist use only their hands to stimulate specific reflex points that correspond with all the glands, organs and systems of the body. By working the hands or feet we primarily effect relaxation or relief of stress and tension. It is said to improve nerve and blood supply helping the body to naturally normalize. It is simple, safe and effective. At The Rejuvenate Colon & Massage Center a session will last approximately 40 minutes with the clients needs addressed appropriately. 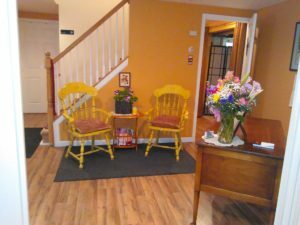 To make an appointment for a Reflexology session please call (570) 253-5170. Karen McConnell is currently enrolled with the International Institute of Reflexology at the third level and enjoys offering this modality to her clients to further benefit their needs for optimal health naturally. Disclaimer: The preceding is to provide information about Reflexology and the benefits that may be derived. It is not intended to claim a cure for any disease or condition. It should not take the place of medical advice or treatment.